Hot process soap is my favorite method of soap making! It’s fast, simple & easy, and you can use the soap the very next day! This article is a detailed picture tutorial with compete instructions for you to be able to make your own handmade hot process soap with confidence. I talk with a lot of people and teach about making soap. One of the biggest reasons people don't make their own soap, even though they REALLY, REALLY want to, is they are afraid of working with lye. I know this...because I had this same problem, and I've talked to many others who are afraid of working with lye too. If you are a beginner to handmade soap making, maybe you feel this way? If so, never fear! I'm about to make those fears go away so you’ll have the confidence to make your own soap! 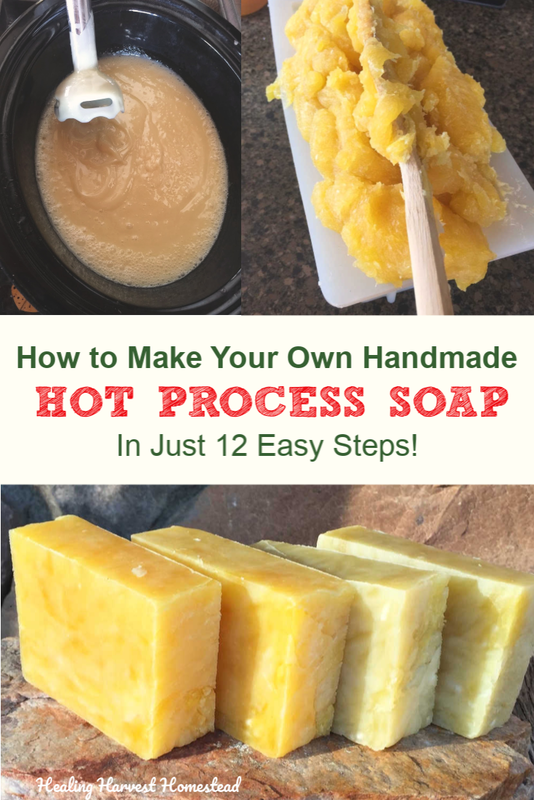 In this step by step hot process soap making tutorial, you'll find directions that are easy, clear, and will help you get started on your handmade hot process soap making journey armed with all the knowledge you need! I remember standing there before my very first soap making session, all decked out in my HAZMAT gear (seriously--lol), and my husband is looking at me with his worried face. "Are you sure you want to do this?" he asked. I took a deep breath, and said, "YEP. I'm going to do this. I AM going to make my own soap." All that research. All the searching for great articles about the process. All the reading of the only book I could find at that time....And I was ready. I remember that day like it was yesterday, even though it was many years ago. I also remember how little information about hot process soap there was out there on the web too! Not much, my friend. So I'm sharing my best hot process recipe with you that just always works, along with super clear directions to help you get started on your own soap making, whether it's just for your family or you want to start a soap business! The soap recipe in this instructional article is truly all natural. For fragrance, I use essential oils, and for color, I use herbs and/or clays. Once you've made a few loaves of hot process soap, you'll want to start experimenting with your own natural additives! For a comprehensive 93 page book on everything you need to know about hot process soap, here is a link to my popular Hot Process Soap Making eBook. Besides learning how to make hot process soap, the book goes into detail about how to use additives, along with 22 soap recipe variations. You can start getting creative with your own handmade soap making right away! You should also take a look at this sister hot process tutorial: Lavender-Rosemary-Vanilla Hot Process Soap, which is also filled with very complete instructions and more pictures for making hot process soap. Hmmm….I just dawned on me: Are you wondering why I love making hot process soap instead of cold process? Here is an article that explains the similarities and differences between the two methods: Cold Process vs. Hot Process Soap Making. I tried to be unbiased. It’s ready to use right away—-there is a very short (and sometimes no) cure time involved. It doesn’t take long to make. A typical hot process soap making session takes around 1 1/2 to 3 hours at most. You get to watch your soap “cook.” This is the saponification process, which is sped up with the hot process method. There are no mysterious reactions happening that you cannot see and fix, if need be. With cold process soap making, you never quite know how it’s going to turn out until you remove it from the mold. With some technique, your hot process soap can look nearly the same as cold process soap. The scent lasts longer in hot process soap. You can find out more about the differences and similarities between the styles of soap making in the article linked above. Here we go with the detailed picture instructions for my favorite hot process soap recipe! Get ready to find out the various stages hot process soap goes through with pictures so you can compare when you make your own soap for the first time. Hot process soap takes about an hour to three hours, give or take; and you'll be able to use your hot process soap the very next day. FTC Disclosure: This post contains affiliate links for your convenience. If you click through and make any kind of purchase I may earn a small commission at no extra charge to you. Here are the basic ingredients for making this hot process soap--not including essential oils for scent or herbs for color. That's it! Lye (sodium hydroxide) is an alkaline chemical that reacts with the oils you use. It is what is responsible for turning the oils into real soap. In fact, according to the FDA, you can't call a bar of soap, "SOAP" unless it is made with oils and lye. That's why, if you take a look at commercial bars of "soap" in the stores, you will not find many (if any) labeled "soap," because they are not made with the natural ingredients of lye and oils. They are now called "cleansing bars" or "beauty bars" or another tricky name. And they are filled with junk chemicals that are often toxic. Just saying. Another nice thing about making your own soap is that it will retain the natural glycerin, which is a by-product of the saponification (oil turning to soap) process. Glycerin is highly moisturizing and great for your skin. Most commercial cleansing bars have had the glycerin stripped out. Want to start making your own hot process soap with my BEST recipe? You'll learn how to customize your soap the way YOU want it in my new eBook, plus everything you need to know about making hot process soap with total confidence! Making soap with lye means you do have to take some safety precautions. You need safety goggles or glasses, plastic gloves, and I like to even wear a long sleeve shirt. Always put your hair back too---it's just better to have it out of the way. You can get these safety items at any good hardware store! One last safety note: Keep your children and pets out of your soap making area while you are working. Here are my current safety glasses and gloves. These probably aren't the best gloves to use because they don't go too far up my arm, but for now, they will work. I recommend using dishwashing gloves that fit you well. 1) 7.2 ounces of lye (I use food grade) See the links below to find out where I purchase mine. You will need to use a kitchen scale to measure out your ingredients, because they do have to be exact. In fact, the closer you get to the exact amounts, the better your soap will be. I usually try to be within hundredths of an ounce when measuring. **See the note at the end of the article for more information about where I get my tools, oils and supplies. Click to Sign Up for the Newsletter & Never Miss a Thing! Set your crock pot on LOW. For this 3 pound recipe you will need a large crockpot. I get the solid oils (Coconut & Shea Butter) measured out first, so they will begin softening--especially in the winter when it's cold! Put these in the crock pot. Step 3) Get the lye solution going while the oils are melting. THIS IS IMPORTANT! ALWAYS MEASURE OUT THE WATER FIRST. THEN THE LYE. ADD THE LYE TO THE WATER! You never want to add the water to the lye because you may end up with a volcano---and this can be dangerous! LYE CAN BLIND YOU OR BURN YOU! So please please remember: ADD LYE TO WATER, not the other way around. Add it slowly, and mix well. This solution will become HOT, so again, please be careful. And...remember your safety gear! Also---be sure to use a heat proof container---I like a large Pyrex pitcher. That's just another added little perk to hot process soap making. You don't have to be spastic about getting the oils and lye solution to the perfect temperatures. Once the oils are melted, gently pour the lye solution into the oils in the crockpot. Get your stick blender (you really MUST have one of these for soap making) and begin to stir. BE SURE TO WEAR YOUR SAFETY GLOVES & GLASSES! The lye solution is caustic, and the soap mixture will be caustic until the lye is completely cooked out. Now put your lid on and "cook" the mixture. It will not take long, usually about 45 minutes to an hour. Soap at trace---It should like like thick pudding on top. This is the first stir. You can still see opaque areas in the mixture--this means it is still caustic and can burn! Plus, it's hot anyway. This stage is often called the “mashed potato” stage. Step 7) STIR, STIR, STIR! In the beginning stages of the cook, you will see the cooking mixture rise up the sides of the crockpot, and if everything is REALLY hot, the whole mass will be rising up! This is fine---just STIR, STIR, STIR, and it will calm right down. Then continue cooking. If you see any opaque areas at all, then your soap is NOT ready. NOTE: Some soap makers insist they do not stir their hot process soap. Honestly, I think a lot depends on the crock pot you are using, because they’re not all the same. In my experience, with the two crock pots I use (both are large, but different brands), I DO stir my soap, and I believe it speeds up the process. Generally, I stir my soap an average of about three times during the cook. Step 8) Keep cooking and stirring occasionally. And keep the lid on the crock pot! You will see it turn into a translucent mass with a gel like consistency. At this point, it is done. This usually takes about 45 minutes to an hour. I tend to let it cook a little longer, even after I think it's ready---Just to be sure the lye is completely gone. See how translucent it is? It is starting to go through the “gel” stage. I've heard good and bad about this next part, but I am a believer in the ZAP test. I used to use fancy pH strips to test for the alkalinity of the soap, but IMHO, the ZAP test works best. All you do is take a little bit of the soap. It should feel "waxy" in your fingers and begin cooling quickly. Place some on the tip of your tongue. If it "ZAPS" you, it is NOT done. It should just taste like soap, with no tingle or zap. If you got the ingredients measured wrong, your soap will definitely have a problem and "get" you! I actually burned my tongue pretty good one time when I got the measurement mixed up for one of the oils, so just be careful. If it looks "weird" then it's probably not right. At this point, while the soap is still in the crockpot, turn the pot off. Let it cool for a minute or two, then you can add your essential oils or scents if you want them. I generally use about 2 ounces or so for a 3 pound recipe, but you can play around with it. Essential oils are very expensive, so this will probably affect how much you want to use. NOTE: You might be interested in this article: Fragrance Oils vs. Essential Oils: The Pros & Cons of Each. Now spoon or pour it into your soap mold! Tamp it down good to get rid of air pockets. Putting the hot soap into the mold. Press it in well to get rid of any air pockets—-you don’t want those! Jan Berry is one of my soap-making heroes! This eBook contains some truly great recipes too! They are all convertible to the hot process method as well! I highly recommend! Here it is, cooling in the soap mold. My molds are a little small for a 3 pound batch of soap, but I just let it cool a bit, then with a sharp knife, slice off the top and form any extra into soap balls. You do this while it’s still a little warm. This is an optional step. The rest of the soap stays in the mold to completely harden. .
After it is completely cooled, several hours or even overnight, you can remove the soap block from the mold and cut it! I actually don't cut my hot process soap right away. I have found that the longer I leave it uncut, the longer my scent lasts too! You can use it right away! Enjoy! That's IT! You have beautiful, moisturizing, natural soap! You can get a free downloadable hot process soap making checklist + basic instructions you can print and use when you make your own soap! It’s been a life saver for me! Just fill out the form below! I hope you enjoyed this complete tutorial, and if you are interested in another excellent step-by-step photo tutorial (including pictures of me doing the “zap” test), check out: How to Make Lavender-Rosemary Soap. "How to Make Natural Soap in a Crock Pot,"
"How to Make Goat Milk & Honey Hot Process Soap,"
"The Secret to Making and Customizing Hot Process Soap,"
"Hot Process vs. Cold Process Soap: Which is Better?" and Can You Use Milk to Make Hot Process Soap? There are lots of others on the website, too! Take a look! I recommend reading all you can about making soap when you are just starting out. It builds confidence! What are your experiences making soap? Leave comments in the comments section if you have questions, want to add anything, or have an experience to share! I love to hear from you! P.S. Remember to fill out this form below to get your free printable soap making checklist PLUS access to all of the resources in the Healing Harvest Homestead Resource Library! I usually make two batches at the same time in two different crock pots---Here are two of the different kinds of soap bars from today!